Doctor Shortage Looming? Maybe Not : Shots - Health News Physicians have been warning for years about a coming shortage of primary care doctors. But others say primary care teams that include other types of health workers might fill the gap better. 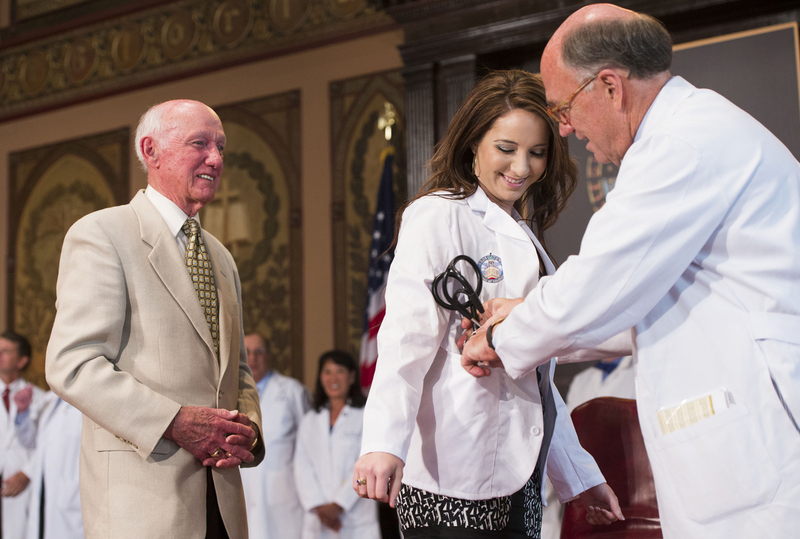 Victoria Elizabeth Fischer was presented with a white coat by her grandfather, Dr. Christian Van Den Heuvel, at Georgetown University School of Medicine in August. 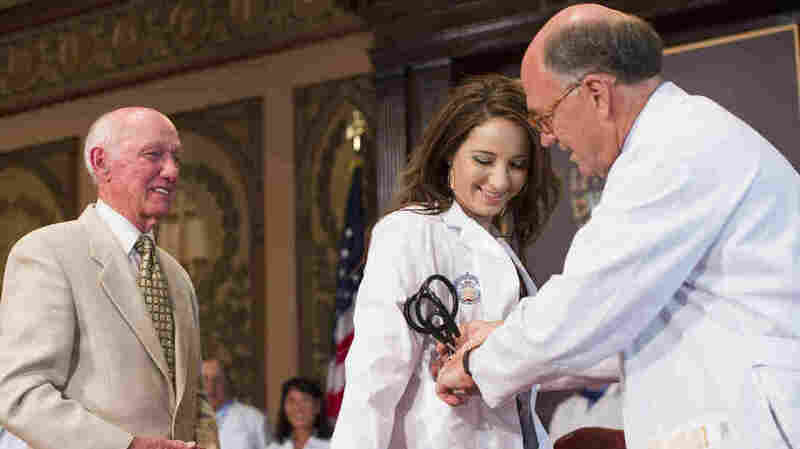 The ceremony marks the start for each new class of medical students. The United States is facing a critical shortage of doctors that could seriously jeopardize the ability of a patient to get medical care in the coming years. Or, at least, that's the message the medical community has been pushing for several years now. And the media (including this reporter) have swallowed the line without much question. But is the shortage real? Not necessarily, say a growing number of health economists and analysts. The most widely publicized prediction of a looming crisis comes from the Association of American Medical Colleges , which has said that by 2025, the U.S. will be short roughly 130,000 doctors. It's not hard to see how the group makes that calculation. Millions of people are getting health insurance for the first time under the federal Affordable Care Act. At the same time, 10,000 baby boomers are qualifying for Medicare every day, says Dr. Atul Grover, chief public policy officer of the AAMC. "And we know, essentially, with the doubling of the population over the age of 65, over the course of a couple of decades, they're driving the demand for services," Grover says. Others point out that the shortage isn't just about the absolute numbers of doctors needed. The demographics of the physician workforce are important, too, says Dr. Andrew Bazemore, who studies the primary care workforce for the Robert Graham Center, a think tank created by the American Academy of Family Physicians. "And that means by their race and ethnicity," Bazemore says, "by their age, by their gender, and backgrounds. Do they actually look like and reflect the populations they are going to serve?" But, while there may be agreement that the U.S. needs more primary care providers, it's not clear to everyone considering the problem whether all of those people need to be doctors. "There are a lot of primary care services that can be provided by a lot of people other than primary care doctors," says health economist Gail Wilensky. She and a colleague recently led an expert panel that looked at the funding of advanced training for doctors. Nonphysician primary care providers can include physician assistants, nurse practitioners, pharmacists and social workers, for example — often working together in teams with a medical doctor. Teams are thought to provide more cost-effective care, according to some health policy analysts. And, says Wilensky, more nonphysician health practitioners, each providing a different set of services, might lessen the need for more primary care doctors. "What will we allow nurses to do — work up to the limits of their license?" Wilensky asks. "Work up to the limits of their training? What will we allow pharmacists to do? Those together would determine how many physicians it would be useful to have around." Wilensky also points out that past studies predicting shortages of doctors have been laughably wrong. "We haven't even been directionally correct sometimes," she says. "We thought we were going into a surplus and we ended up in a shortage — or vice versa." Still, Atul Grover of the medical school association thinks it's better for society to err on the side that the shortage is real. "We don't think we should put patients at risk by saying, 'Let's not train enough doctors just in case everything lines up perfectly and we don't need them,' " Grover said in a recent C-SPAN interview. But letting more people train to be doctors "just in case" strikes Wilensky and many other health economists as wasteful. "Are you really serious?" Wilensky asks. "You're talking about somebody who is potentially 12 to 15 years post-high school — to invest in a skill set that we're not sure we're going to need?" Training too many doctors could, potentially, jeopardize more than just the bank accounts of those being trained. Dr. Fitzhugh Mullan, a pediatrician and professor at George Washington University, says every doctor added to the health care system also adds cost. "Training another doctor," he says, "isn't cheap — isn't cheap for the individual doing the training, isn't cheap for the institution providing the education, and ultimately isn't cheap for the health system. Because the more doctors we have, the more activity there will be." Why, then, do so many physician groups continue to press for more doctors to be trained? Princeton health economist Uwe Reinhardt says there's at least some self-interest involved. "The business model of an interest group is to create a sense of crisis," he says, "and then tell their constituents, 'We can help you.' "
There is one element of the debate that just about every expert agrees on — that the U.S. has to stop paying physicians based on the number and type of treatments and procedures they do, and instead base payment on how well they keep patients healthy. That might or might not reduce the need for more medical doctors. But it would almost certainly help close the payment gap between specialists and generalists. "The physicians are the team drivers of the system," Wilensky says. "If you don't get that part right, either in terms of how they're trained or how they're paid, it's hard to imagine how health reform happens."